In the wake of the 2016 election, everyone from President Obama to Pope Francis has raised concerns about fake news and the potential impact on both political life and innocent individuals. Some fake news has been widely shared, and so-called “pizzagate” stories led a North Carolina man to bring a gun into a popular Washington, D.C. pizza restaurant under the impression that it was hiding a child prostitution ring. Though they sense these stories are spreading confusion, Americans express a fair amount of confidence in their own ability to detect fake news, with about four-in-ten (39%) feeling very confident that they can recognize news that is fabricated and another 45% feeling somewhat confident. Overall, about a third (32%) of Americans say they often see political news stories online that are made up. While it is difficult to measure the precise extent to which people actually see news that has been completely fabricated – given that news consumers could see but not recognize made-up news stories as well as mistake factual stories for false ones — these figures provide a high-level sense of the public’s perception of this kind of content. And some Americans say they themselves have shared fake news. 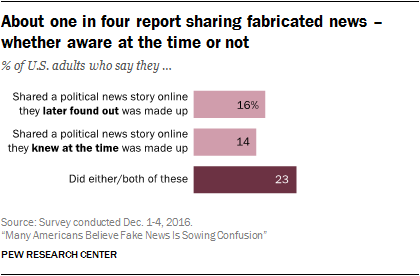 Overall, 23% say they have ever shared a made-up news story, with 14% saying they shared a story they knew was fake at the time and 16% having shared a story they later realized was fake. 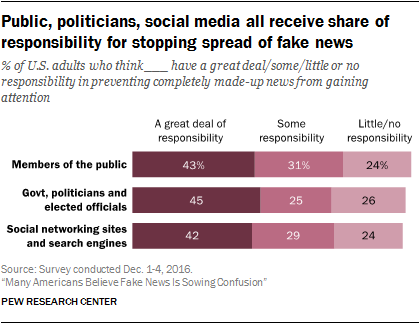 When it comes to how to prevent the spread of fake news, many Americans expect social networking sites, politicians and the public itself to do their share. Fully 45% of U.S. adults say government, politicians and elected officials bear a great deal of responsibility for preventing made-up stories from gaining attention, on par with the 43% that say this of the public and the 42% who say this of social networking sites and search engines. Although the overall portion of Americans who place responsibility on each is about equal, individuals have different perspectives on how that responsibility should be distributed. Just 15% of Americans place a great deal of responsibility on all three of these groups, while a majority (58%) feels instead that one or two of them bear a great deal of responsibility. While fake news became an issue during the highly charged 2016 presidential election campaign, Republicans and Democrats are about equally likely to say that these stories leave Americans deeply confused about current events. About six-in-ten Republicans say completely made-up news causes a great deal of confusion (57%), and about the same portion of Democrats say the same (64%). And although independents outpace Republicans (69% say fake news causes a great deal of confusion), they are on par with Democrats. This perception is also mostly consistent across education, race, gender and age, though there is some difference by income. While a majority of those who make less than $30,000 a year say fake news causes a great deal of confusion (58%), this is a lower proportion than among those who make between $30,000 and $75,000 (65%) and those who make $75,000 or more (73%). Again, there are no differences between partisans: 36% of Republicans, 41% of Democrats and 40% of independents say they are very confident in their ability to recognize news that is made up. There are also no consistent differences in who feels very confident in terms of age, gender, income or race. Nearly one-in-three U.S. adults (32%) say they often see fake political news online, while 39% sometimes see such stories and 26% hardly ever or never do. In a rare instance of demographic differences, whites are more likely than blacks and Hispanics to say they often see fake news, and those with annual incomes of at least $75,000 are more likely than those who make less than $75,000 to say so. 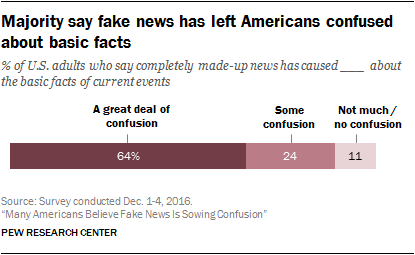 Americans show some discernment between almost completely made up political news stories and those that are partially inaccurate. 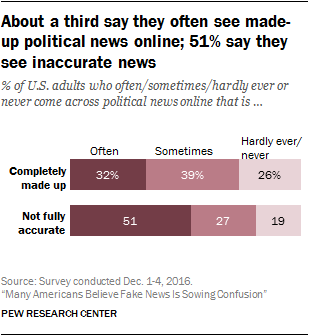 About half (51%) of U.S. adults say they often see political news online that is at least somewhat inaccurate – a higher proportion than those who say they see news that is almost completely made up. Taking these two questions together, about a quarter (23%) of U.S. adults say they have ever shared a fake political news story online, whether knowingly or unknowingly, with 7% sharing both when they did and did not know a story was made-up, 9% sharing only when they did not know, and 7% sharing only when they did know. If the spread of fake news is a problem, who bears responsibility for addressing it? In the month since the presidential election, social networking sites and search engines have taken steps to address the issue. And there have been calls for the government and the public itself to take action as well. Americans collectively assign a fairly high and roughly equal amount of responsibility to all three of these groups. Fully 45% say government, politicians and elected officials have a great deal of responsibility, roughly equal to the proportion who say a great deal of responsibility lies with members of the public (43%) and with social networking sites and search engines (42%). While each of these three groups was seen as responsible by about an equal share of the public, it is not the case that every American thinks each bears a great deal of responsibility. In fact, only 15% of U.S. adults say this of all three groups, while 58% named one (31%) or two (27%) of the three groups. Age is the only area where clear demographic differences emerge. Americans ages 50 and older are more likely to place a great deal of responsibility on the government (53%) than those ages 18 to 49 (38%). There are no demographic differences for how much responsibility the public or social networking sites and search engines owe. There is also a partisan difference on how much responsibility the government has to prevent the spread of fake news. While about half of both Republicans (48%) and Democrats (49%) say the government has a great deal of responsibility, only about four-in-ten independents (38%) say so. There are no partisan differences in terms of the responsibility assigned to the two other groups, however. Those who say they often see made-up political news online are more likely to say each of the three groups has a great deal of responsibility. About half (53%) place a great deal of responsibility on politicians (compared with 41% who see fake political news online less often), on social networking sites and search engines (53% vs. 37%) and on the public (51% vs. 39%).